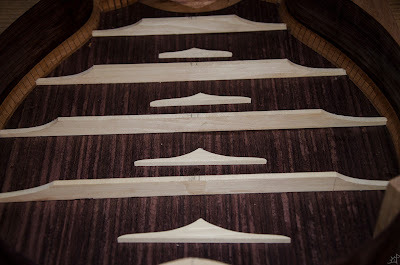 Where I last left off, the back panel was jointed and joined, the sides affixed with kerfing, and the lot sanded plane. 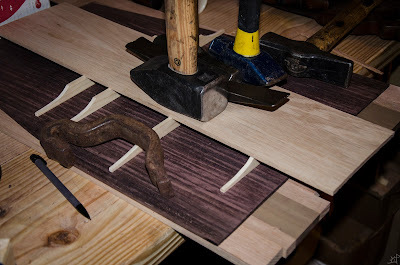 Now it is time to attach the braces to the back and fit them in the kerfing in a predictable and repeatable way that can also serve as a means to keep the sides in proper square alignment. 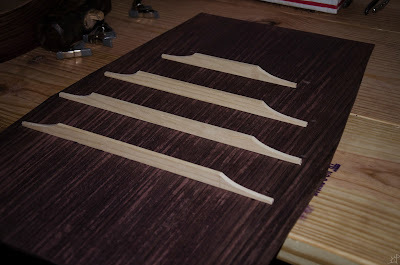 To do this, I had to figure a way to mark the sides in a way that would be perfectly perpendicular to the neck. 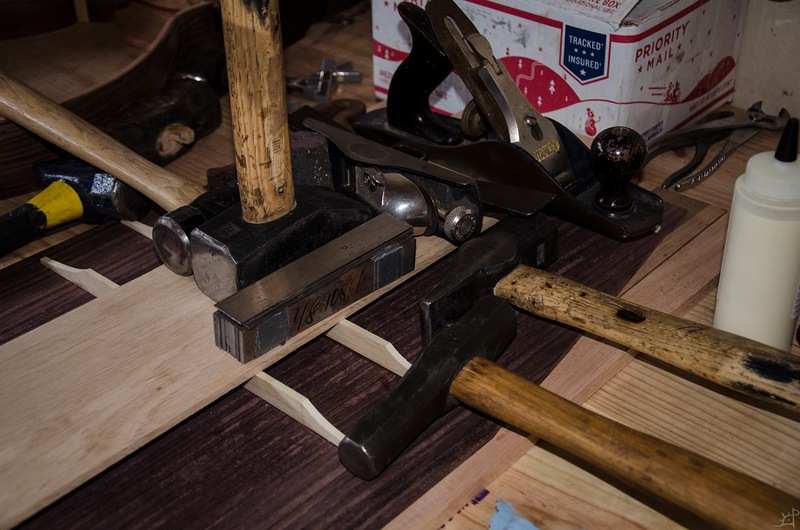 This involved a great deal of trial and error, moving clamps and weights around until I was satisfied with the positioning. 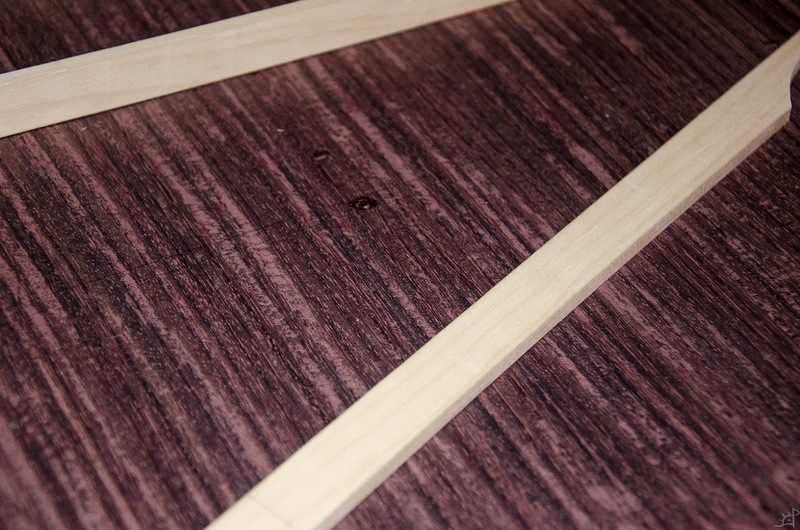 A jointed board serves as a line connecting the heel and neck blocks, and with the help of a square and second jointed board, I was able to align points on the asymmetric sides. 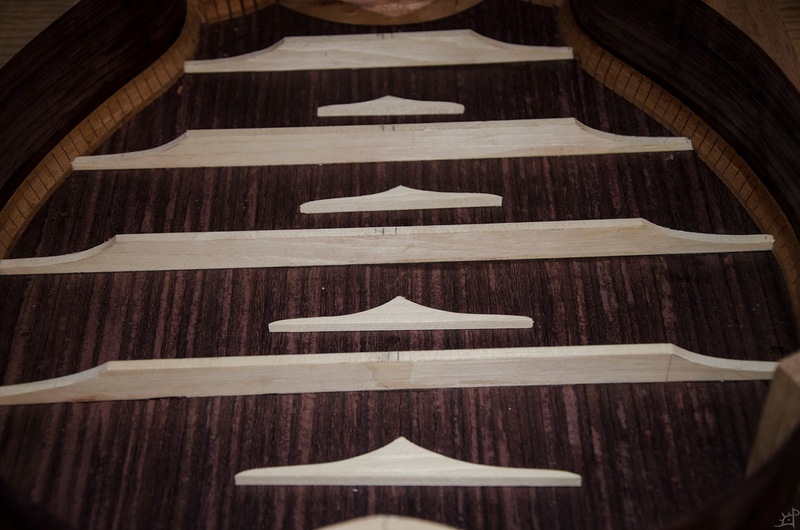 The board parallel with the neck was marked in two places where roughly the sound hole would be placed. 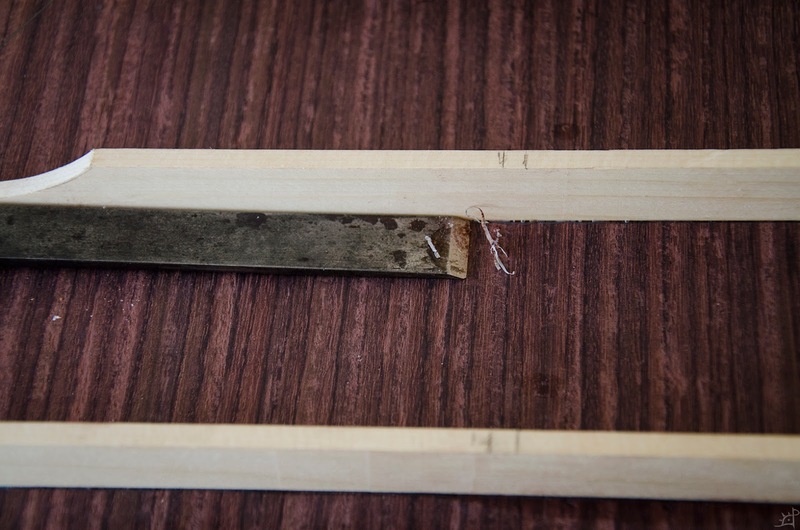 This is to prevent placing a brace directly under that opening which will look down from underneath the strings. While there is (as far as I know) minimal impact as far as acoustic design is concerned, I did not want to have a brace positioned such that it was somewhere beneath the sound hole and thus awkwardly visible from the top. With the shooting board, I squared off the ends of the braces I cut in the last post. Although only a small bit of them will be in contact with the kerfing, having it square to the length of the brace makes this process much more predictable. Evenly spacing out four long braces at intervals on the sides, I marked a line for the bottom edge of the brace, then traced the brace itself for the second line. 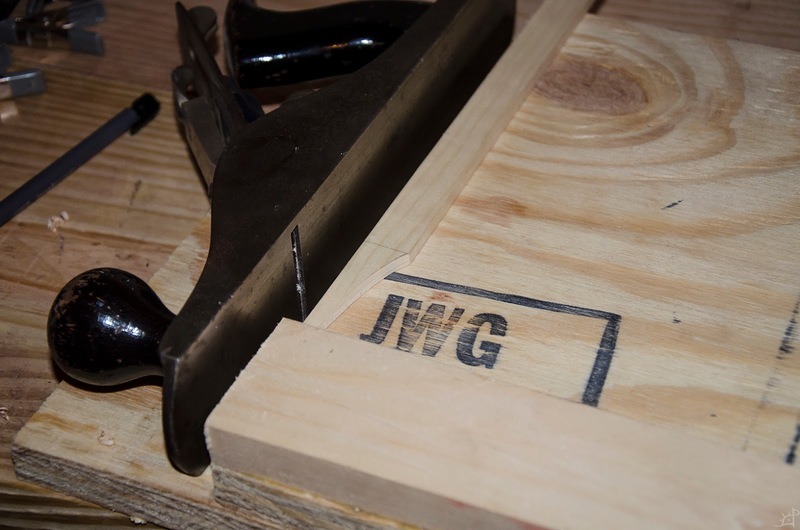 Between these two I cut a notch that the brace wood fits snugly into. 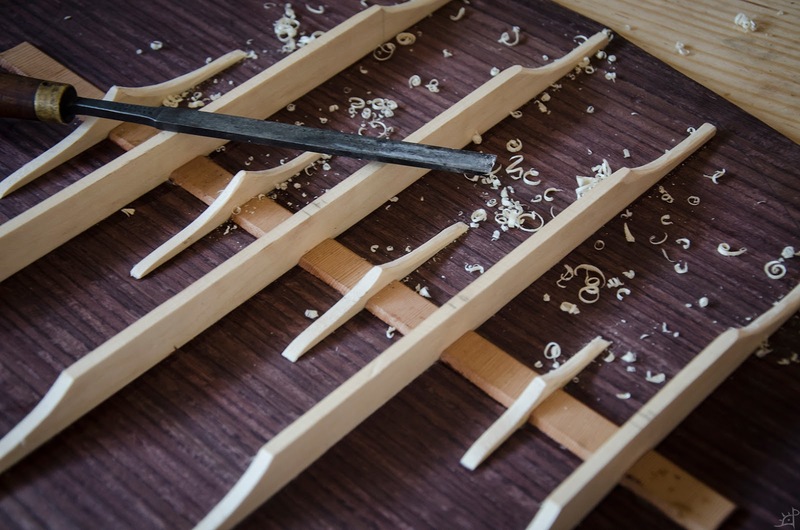 Because the braces were resawn by hand, they are not all the exact same width, and there is also a slight variation from one end to the other of a particular brace. Thus, each individual notch needed to be carefully marked at the precise location along its length. 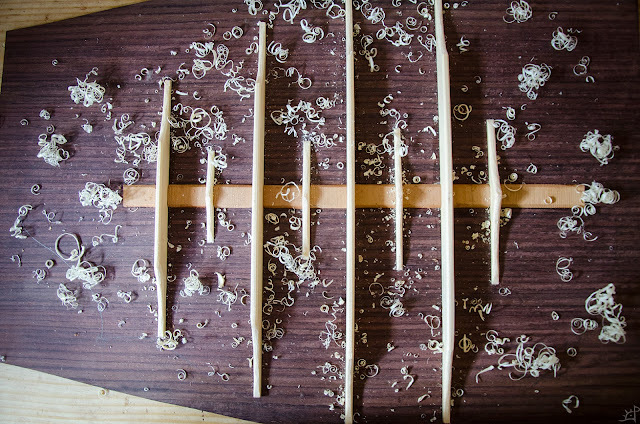 Scalloping the ends of the braces allows for some acoustic design that I invented based on seeing other instrument interiors. For these, I made 6cm curves to a depth that extended to a position that makes sense with the bevel cut in the kerfing. The template, pictured above, became the master pattern with which all the scalloping was cut. Here you can see the braces in place. 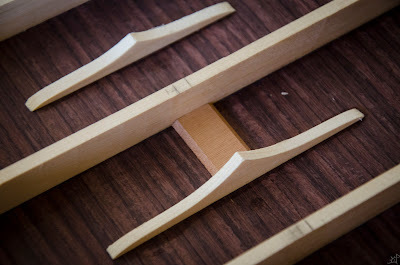 The top of each brace, as pictured above, is exactly flush with the kerfing. As you might have noticed, I chose to make the braces based off of the configuration of the sides rather than first attaching them to the back. 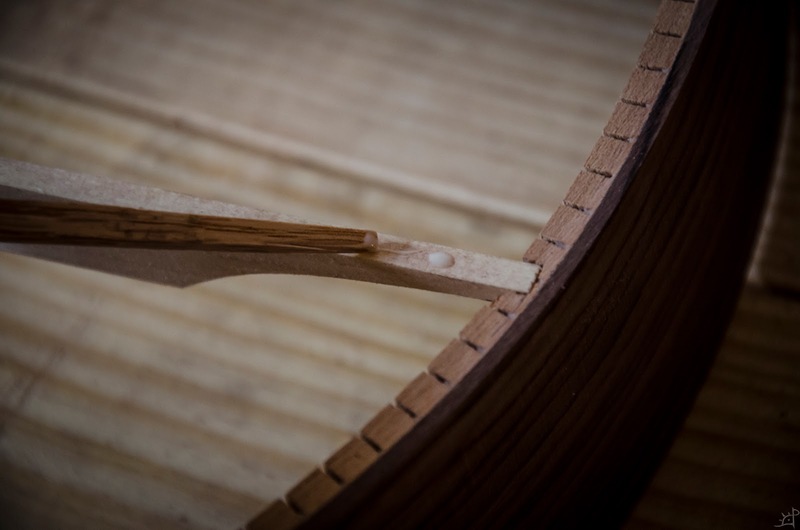 The reason for this is this- Positioning the ends of the braces is much easier and more accurate with access to the sides throughout the process, and the sides themselves are held in their proper position by weights. 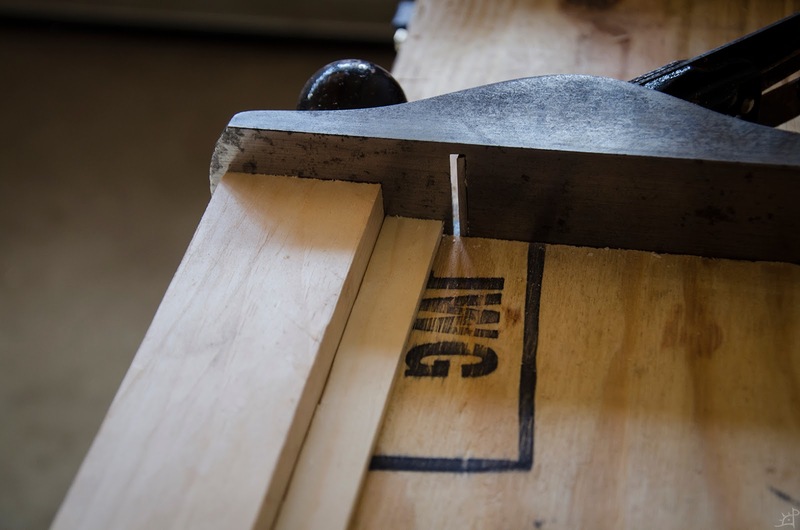 First attaching them to the back would have introduced a host of complications that would have resulted in a nightmare of calculations and imprecision to the fit, spacing, and pairing of the two parts. Now to actually attach the braces to the back, I used a trick I picked up somewhere along the way. 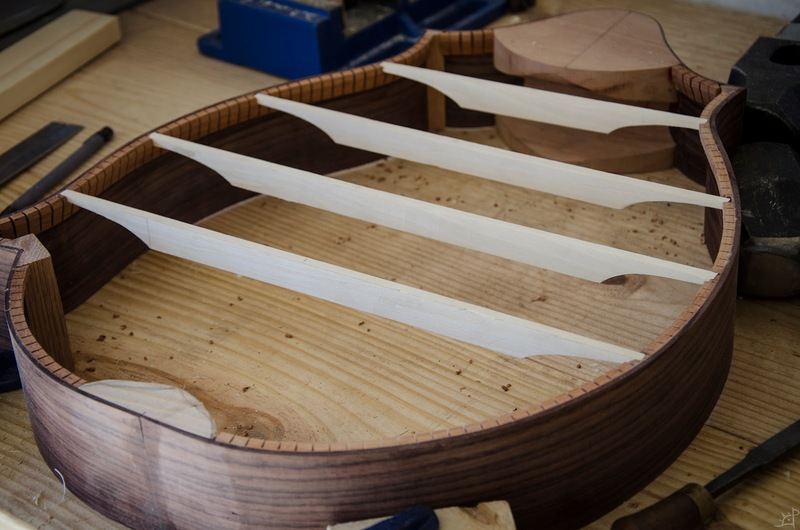 By applying a very slight amount of glue to the ends of each brace, they will be temporarily joined to the back and lifted out of the sides without moving, then permanently joined later. An hour later the glue has cured enough to hold the braces through extraction. This position is the only position that will now fit with the sides. Fortunately, it is now easy to trace the edges of the braces onto the rosewood. Although it is difficult to see, I scribed lines around the entire parameter of the braces, making extra long lines at the corners and ends. Then, all it took was a little shearing and the drops of glue failed, leaving me a perfect outline of where to permanently glue the braces. I should note that I marked each brace as to the number and orientation before removal. Re jointing the braces and using a chisel to remove the glue from the back, the surfaces are now ready for their final fit. While it might seem as though this is all needless effort, and that I could have just glued the braces in their final place to begin with instead of only using a small drop of glue, there is actually a reason this is all necessary. 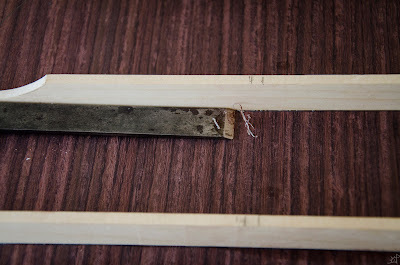 Unsupported in the centre, and supported only by a small notch on the ends, I would not be able to apply sufficient weight or clamping pressure while the glue dried to have a secure, reliable joint. Instead, I need full support underneath the brace or back. 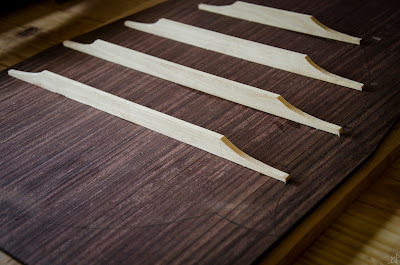 Gluing these back into position was tricky and required a bit of forethought. 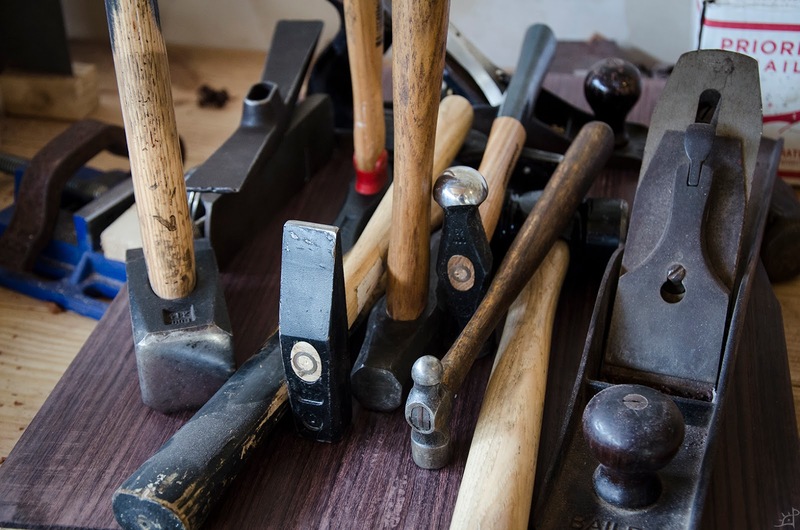 Because the members are so thin, it was entirely likely that under the weight of various hammers and bits of scrap metal, the height could skew to one side or the other, or in the worst case, twist. 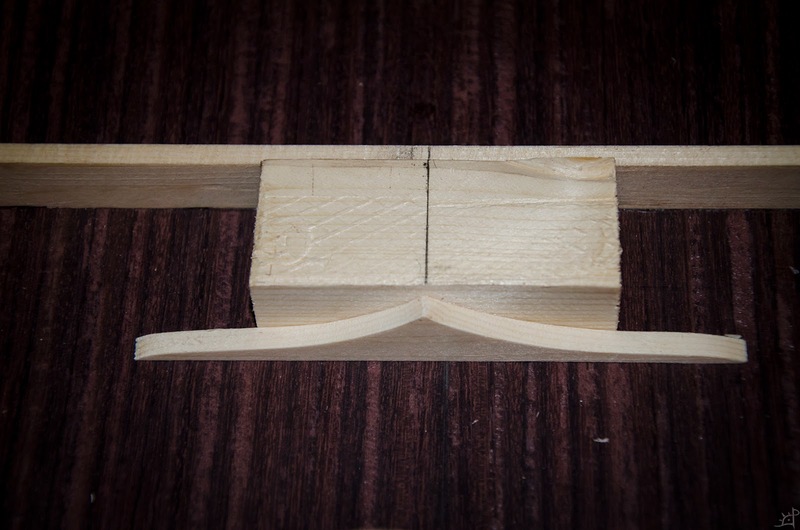 To counter this, I glued the bottom most brace first, using the unsecured others as support blocks spread out on both sides as pictured above. 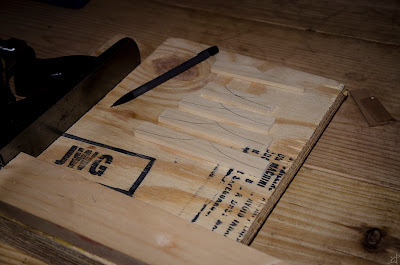 The one glued (with the hammers over it) then had the lateral support it needed to dry square. Second, I did the forward most brace. Now, the bottom one which has already cured, acts as a support, with the other two unglued acting as support on the other side. 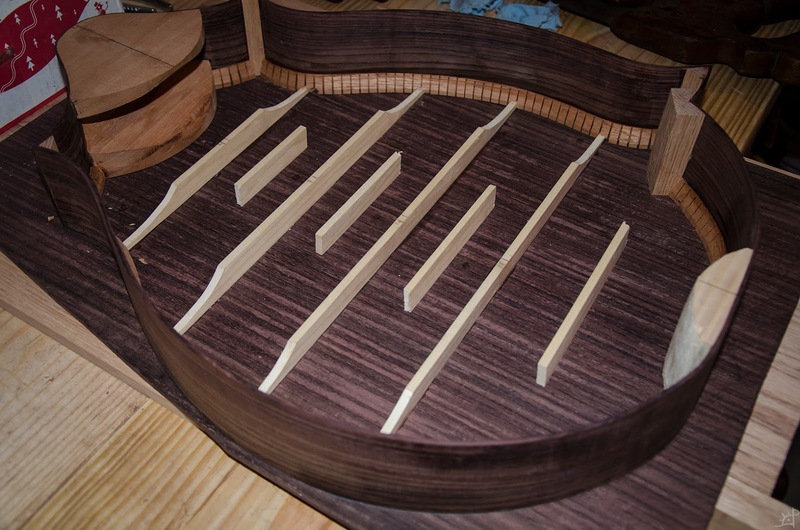 With the first and fourth glued, the middle two would now both have secure lateral support. 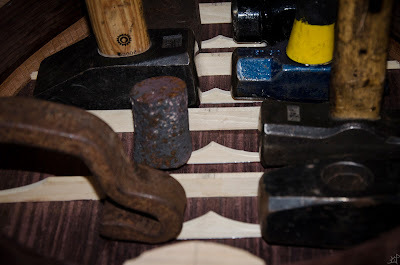 Through a combination of scraps, hammers, and planes, the middle two were weighted down the lot left to cure overnight. Success! These braces, paired with the notches in the kerfing, hold the sides squarely without any further use of clamps. What is more, that sideways force of the sides holds it to the back securely enough to handle while dealing with the rest of the interior skeleton. Although the braces are solidly attached, there is a bit of cleaning that needs to be done. 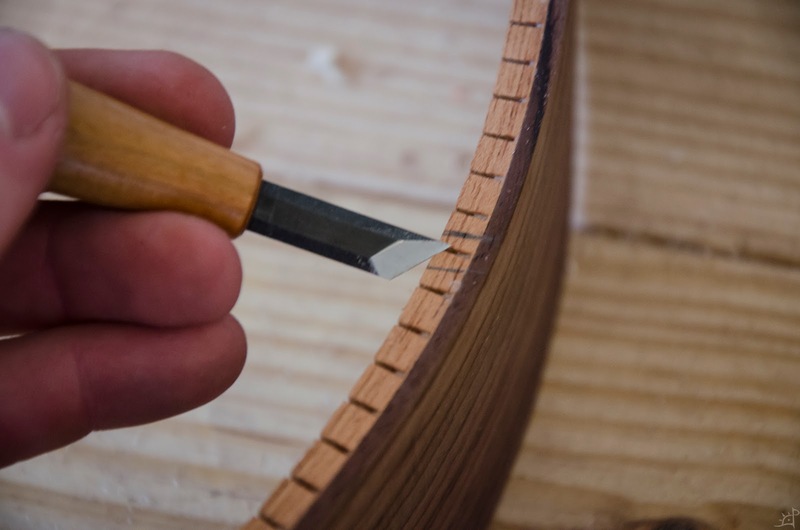 Excess glue on the surface that could not be cleaned off when wet will be removed as well as carving the final adjustments to the shape. Sharp tools are the greatest. Four braces would have done the trick when paired with a back joint. However, I am no longer able to see where the actual seam between the two pieces actually lies, and I suspect that it is slightly off of the mandola's true centreline. As an added bit of security, I decided to add four more smaller braces, using the ends of the longer ones I already cut. With that same scalloping template, I copied the curve, but adjusted it slightly so the ends of the curve converged with the long edge. 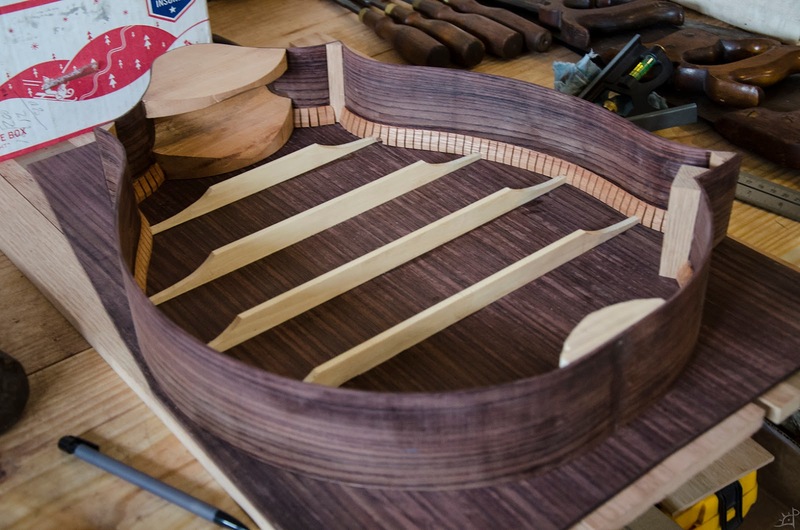 This is because it will not register with the kerfing and needs to blend into the surface of the rosewood. Progressively scaling down in both length and height, these braces are proportional to the width of the sides at their respective placement. 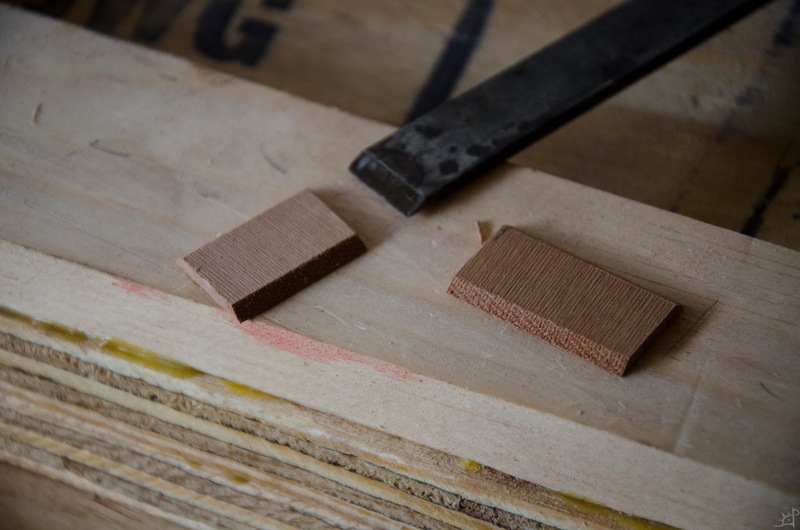 A bit of scrap cut down to size is used to centre the braces and keep them parallel to the attached ones. The line on it, paired with the centre of the body, helps ensure that the small braces are also centred from side to side. 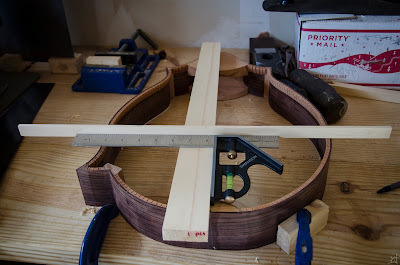 Once more, various weights hold down the braces while the glue sets. After curing, they receive the same treatment of chisels to remove excess glue. 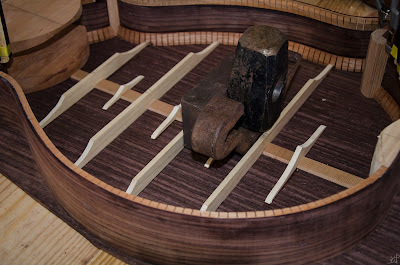 Had I been able to find the centre joint of the rosewood back and use it as the positioning line for the braces (which was not possible because of the asymmetric shape and size of the wood), I would have added the back jointing after only fitting four braces. The process remains the same, however. 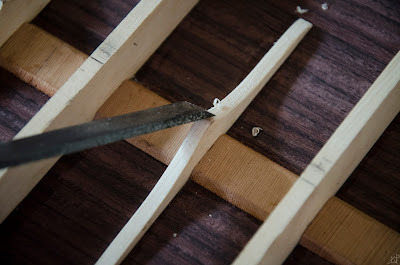 With a chisel, I split off small sections slightly wider than the distance between the braces. 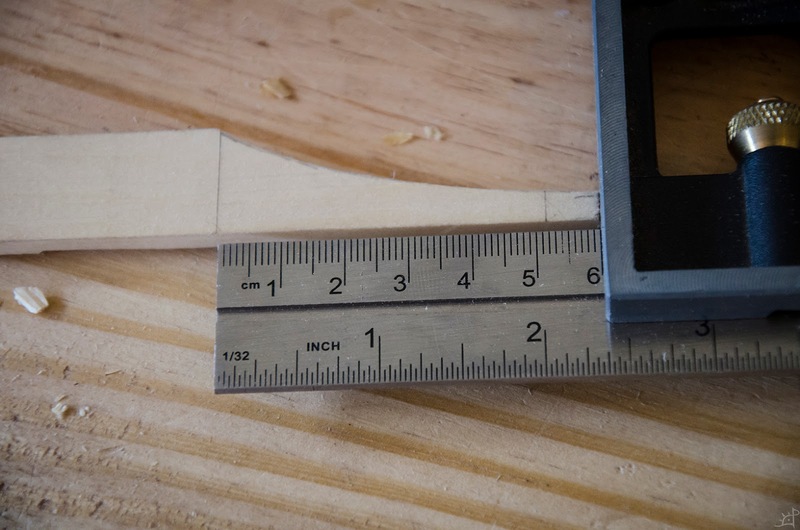 Due to the angle, it was difficult to measure the precise length needed, and so I instead used the shooting board to work them down until the fit was tight but not overly so. Finding weights that fit between the braces was difficult, so I could only glue them two at a time. Lastly for this post, I worked down the corners of the braces to make them round and smooth. As I understand it, hard edges are bad for acoustics. If not, they are bad for aesthetics, so they still needed to go. 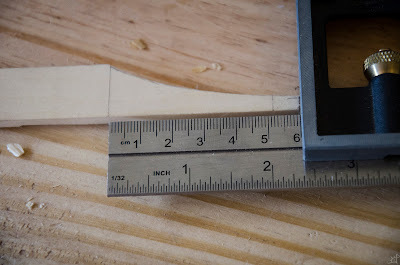 In the debate of bevel down v. bevel up, I have found that the only difference is made by the geometry of what you are cutting. For the long, straight edges, I used the bevel up and the back of the chisel to register along the cut, but for the scallops, bevel down so I was able to cut cleanly along the tight radius. To each their own. And that's it. Next time, I'll be working the skeleton of the top, which is surprisingly very different in design and purpose.